The book, Power of Balance by Clint Mendoza will be launched together with an art exhibit reflecting the book’s theme on 18 August 2012, 8:00pm at the Vinyl on Vinyl Gallery at The Collective, 7274 Malugay St., Makati City. The launching will also feature art works by various artists specially commissioned to reflect the book’s concept. Admission is free. Each artist’s unique exploration of the various contemporary-cultural interests and expressing them using various visual mediums is reflected in Clint Mendoza’s take on the various human areas of life that is essential in obtaining happiness and success. As each artist slowly reveals their inner perception of the literature, Mendoza likewise dissects the core of human behavior and examines how it holistically affects man’s soul and persona. Influenced by generations involved in contemporary, urban art, graffiti, poster and street art, manga and comic book illustrations, established and emerging artists fuse to create a new art movement. Their transformation entwined with the narrative which in this instance, Art and Literature became one. People work so hard in trying to achieve specific goals and aims in their life that they forget the purpose of their existence and often get out of balance. Mendoza identifies seven basic aspects of life that needs to be equally balanced in order to tap the evasive happiness and success. These imbalances in life more often than not affect not only one aspect of our lives but, in fact have a knock on effect which affects the rest of our life. 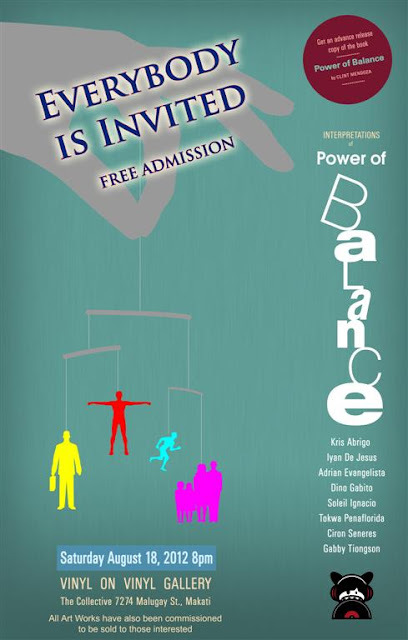 The Power of Balance (published by Primoris Enterprise) by Clint Mendoza offers insights and advice related to this dilemma. Advance release copies of the book will also be available in the event. Power of Balance was written to enlighten people on the precariousness of life and to help them achieve a balanced lifestyle. It teaches new principles and concepts which can help change their perspective of work and life in general. The Power of Balance further persuades us to identify our “personal beliefs” and aids us in making the right daily choices. Our success (or failure) is often the compounded results of our daily choices in life. It endeavours to empower us with a balanced self which we eventually need to expand outwards thereby harnessing the unlimited power of balance. Clint M. Mendoza started writing at the age of 13. He is a strong advocate of justice and equality. He graduated from the University of the Assumption (UA) with a Bachelor's Degree in Business Administration major in Marketing Management. He was bestowed the top BSBA student award in 2006 & 2008. He also became one of the region’s Top 15 Students in 2009. At 21, he worked as an assistant manager in one of the country’s top company. The following year, he became the branch manager for a multinational corporation. At present, he is currently a University Instructor in one of the country’s state university. He is also pursuing his Master’s Degree in Business Management at Holy Angel University. Apart from writing, he enjoys photography and cars. He is also the founder of the Pampanga Writers Circle which aims to develop enthusiastic writers in the region. He is also currently polishing his romance inspired novel which was highly praised in its first review. Primoris Enterprise is the leading publisher for emerging self-publishing authors. For more information about the publisher, email md@primorisph.com. For other queries, you may send an email to: promotions@primorisph.com, author@clintmendoza.com.